The revolutionary antislip waterproof sock shoes from the stable of Puppy Love got a tad smarter with its latest shades of neon. What more? These anti slip water proof sock shoes now come with an additional padding in comparison to the regular ones. They have an additional Velcro strap just incase if you need to provide a better grip to your pooch while walking. These sock shoes have anti-slippery properties and provide adequate grip on wet surfaces. Vitrified tiling and marble flooring are commonly found in urban households. Such flooring could lead to serious injuries and hip displacement in dogs. 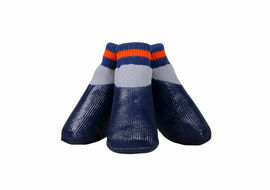 These anti slip sock shoes from Puppy Love provide easy traction which lets them grip on slick floors. The sole is not made up of ordinary rubber that you find in most hard shoes made for dogs. 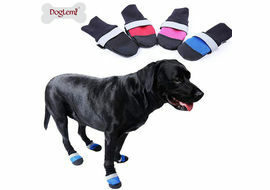 While walking dogs tend to stretch their paws and these anti-slip water proof socks shoes provide the perfect support with ‘expand and contract’ mechanism. Most importantly they come useful for hip and ligament issues and arthritis. For senior and injured dogs, Puppy Love Anti Slip Waterproof Sock Shoes are highly recommended by veterinary doctors. The broader base of anti slip sole is made of a special water proofing material which gives a firm grip to dogs walking on urban flooring. Moreover the special material doesn’t heat up the paws of your dogs. Please Note: The sizings are as per international standards. Please refer to the size chart before making a purchase. ABOUT PUPPY LOVE: Puppy Love is one of the most premium brands in the division of pet accessories in India. The company manufactures some of the most gorgeous looking leashes, collars, personalized name engraved collars, pet foot care materials ranging from anti skid shoes to water proof socks, blankets and other cute stuffs. All items of Puppy Love give a scintillating look to your pet as if they are dressed up for a party. The revolutionary antislip waterproof sock shoes from the stable of Puppy Love got a tad smarter with its latest shades of neon. What more? These anti slip water proof sock shoes now come with an additional padding in comparison to the regular ones. They have an additional Velcro strap just incase if you need to provide a better grip to your pooch while walking. 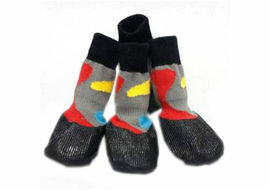 These sock shoes have anti-slippery properties and provide adequate grip on wet surfaces. Vitrified tiling and marble flooring are commonly found in urban households. Such flooring could lead to serious injuries and hip displacement in dogs. 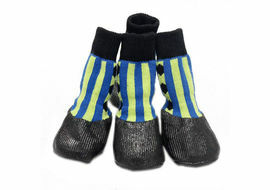 These anti slip sock shoes from Puppy Love provide easy traction which lets them grip on slick floors. The sole is not made up of ordinary rubber that you find in most hard shoes made for dogs. 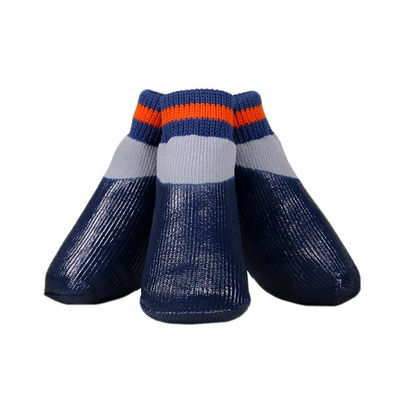 While walking dogs tend to stretch their paws and these anti-slip water proof socks shoes provide the perfect support with ‘expand and contract’ mechanism. Most importantly they come useful for hip and ligament issues and arthritis. For senior and injured dogs, Puppy Love Anti Slip Waterproof Sock Shoes are highly recommended by veterinary doctors. The broader base of anti slip sole is made of a special water proofing material which gives a firm grip to dogs walking on urban flooring. Moreover the special material doesn’t heat up the paws of your dogs. 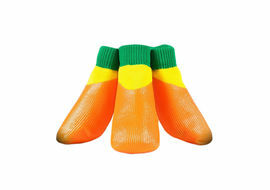 Benefits:• These socks prevent nail marks and scratches on hardwood floors and car interiors. Unlike hard shoes, anti skid are easy to use just pull it over the paws and your pooch is all set to rock and roll• Dogs have a tendency to spread their digits while walking. 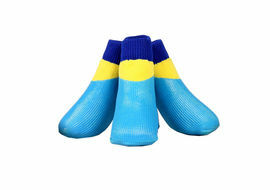 Anti skid socks from Puppy Love offers easy expansion of the paw inside the socks• 100% washable. Just remove and toss it in your washing machine while washingContent:Set of 4 anti slip water proof sock shoes Please Note: The sizings are as per international standards. Please refer to the size chart before making a purchase. Extra Small - Toy Breed Dogs (Chihuahua)Small – Small Breed Dogs (Pugs, Shitzu and Lhasas)Medium – Medium Breed Dogs (Cockers, Mongrels, Small Boxers) Large – Medium to Large Breed Dogs (Large Boxers, Small American Labradors) XL – Large Breed Dogs (Big Labradaors, GSDs and Godlen Retreivers, some giant breeds) SIZE CHART: SIZE HEIGHT WIDTH From Middle Finger to Front Ankle From 1st fingerto 4th finger XS 4.5 cms 3.7 cms S 5.2 cms 4.3 cms M 6.0 cms 5.0 cms L 6.8 cms 5.6 cms XL 8.0 cms 6.6 cms ABOUT PUPPY LOVE: Puppy Love is one of the most premium brands in the division of pet accessories in India. The company manufactures some of the most gorgeous looking leashes, collars, personalized name engraved collars, pet foot care materials ranging from anti skid shoes to water proof socks, blankets and other cute stuffs. All items of Puppy Love give a scintillating look to your pet as if they are dressed up for a party.